Brain tumours vary in severity, and their impact changes depending on whereabouts in the central nervous. Moreover, they are becoming more common - the UK Brain Tumour Society says that their incidence has increased by 45% over the last 30 years. Despite this, support groups say, research into treatments remains underfunded. Brain tumours are a mass of cells - either abnormal or normal - that grow unnecessarily in the brain. They can be malignant or benign. Benign tumours grow slowly and rarely spread. Malignant ones can grow rapidly and attack structures in the brain. 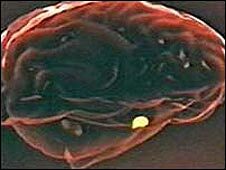 Malignant brain tumours are sometimes known as brain cancer, although not all of them exactly fit a general description of cancer. This is because tumours that originate in the brain are unlikely to grow outside the central nervous system, and one of the characteristics of cancers is that they can spread to distant parts of the body. Brain tumours are unique in that they occur within the skull - leaving them very little room to expand. However, about 40% to 44% of brain tumours are benign. This depends on whether the tumour is a primary brain tumour, meaning it originates in the brain, or a metastatic brain tumour, which means it starts elsewhere in the body. Metastatic tumours occur when cancer from another part of the body - such as a lung or breast cancer - spreads to the brain. By definition, metastatic tumours are malignant. The causes of primary brain tumours are unknown, making prevention difficult. Brain tumours have both general symptoms and symptoms that depend on the tumour's location. General symptoms begin with non-throbbing headaches that come and go - most patients will have them at some stage during their illness. They are worse in the morning and when exercising or changing position. Seizures are also common, and are caused by disruption in the brain's electrical activity. Problems with mental ability such as memory, speech and concentration can occur, and more severe mental changes affecting behaviour, temperament and intellectual ability also affect patients. The growth of the tumour can result in pressure building up inside the skull - causing nausea, drowsiness and vision problems, as well as headaches and mental problems. As pressure increases, consciousness fades and the patient requires prompt treatment. Primary brain tumours particularly affect the very young and the very old. Metastatic tumours are more common among adults. Because doctors have not yet established what causes primary tumours, they cannot identify other specific risk factors. Surgery is effective for many tumours, but the location of the tumour can make it difficult to reach. If surgery cannot remove the entire tumour, chemotherapy or radiation treatment will also be offered. As many tumour patients are left with mental or physical problems, rehabilitation will also play a part in the treatment. The outlook depends on so many factors that it will be different for most patients. It depends on where the tumour is situated, and what type of tumour it is, but a benign tumour in a dangerous position can be more deadly than a malignant one in a relatively harmless spot. Campaigners in the US and the UK complain that research into tumours is pitifully inadequate. What research there is centres on two areas. First, doctors want to establish the cause of brain tumours, and are doing this by analysing who gets them. Second they want to look at new treatments and surgical techniques that require as little penetration into the brain as possible. Future treatments include the possibility of a pill or gene therapy. This page contains basic information. If you are concerned about your health, you should consult a doctor.